Be prepared to be wowed by the beauty, uniqueness and sheer splendor of Greece when new TV series, My Greek Odyssey, commences on Sunday, March 24, screening on the Seven Network at 1:30pm in Sydney, Melbourne, Perth, Hobart and in regional areas, plus 5pm in Darwin. 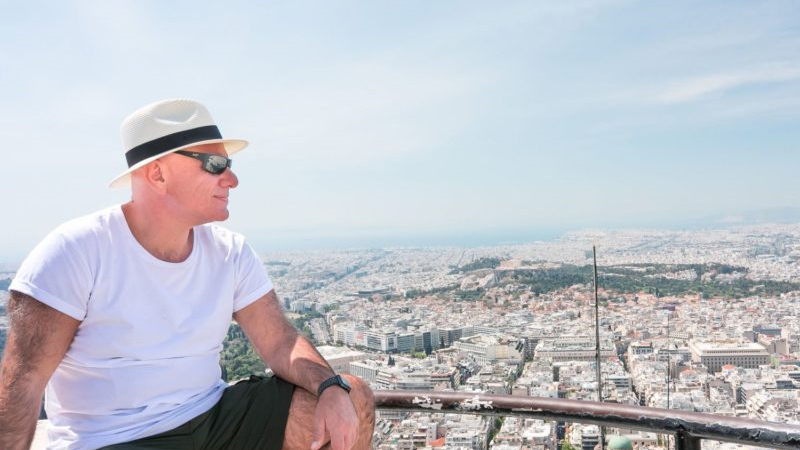 Peter has sailed his super yacht Mia Zoi (translated from Greek meaning One Life) amongst the Saronic and Ionian Islands, visiting fascinating destinations including Hydra, Spetses, Corfu, Zakynthos and Kythira. Throughout the series, he visits some jaw-dropping, colourful sites as well as little-known gems that rarely get a mention. Along the way he explores the rich history, culture and cuisine of Greece and meets some truly unique people. Peter’s personal story is an inspiring rags to riches tale. Born to Greek migrants who settled in Australia over 50 years ago bringing nothing but their suitcases, he grew up in modest surrounds in Eastern Sydney. From these humble beginnings, Peter is now the co-founder and CEO of one of Australia’s most successful companies in the design and construction industry, Ganellen, who are engaged in over $850 million worth of major projects throughout Australia and New Zealand. When he is not overseeing the business, Peter spends every chance he can get to explore Greece and has the ultimate ambition of visiting all 227 inhabited islands. In addition to series one, series two has also been shot, and will take viewers to the Northern Aegean and Western Cycladic regions, from the centre of the Eastern Orthodox faith in Mt Athos, to the islands of Thassos in the north, and along the eastern edge of the Greek islands. Series one has already gained enormous interest throughout the globe having secured licensing rights in 40 countries so far including Greece, Spain, Egypt, Russia and the United Arab Emirates. Our journey begins in the Greek capital of Athens. It’s one of the oldest cities in the world. It’s the birthplace of democracy, philosophy, modern medicine, mathematics, free speech and the power for you and I to vote for our elected officials. The city is also packed with ancient ruins, many of which are amongst the most recognisable sites on the planet. In this episode we start the odyssey by exploring this magnificent city, as well as delving into the foundations of the nation’s religion, told through experiencing the festivities of Easter. Top General Experience – Escorting the Presidential Guard as they marched up to the Acropolis to raise the flag. This happens only on Sunday mornings and no one is allowed to attend with the exception of the Presidential Guard and the band playing the national anthem. It was an amazing experience. This episode I’m leaving the big smoke and heading across the Aegean to Epidavros. Here I’m going to delve into the history and unique culture of the region. It’s a part of the country that many of the city dwellers visit for holidays, but for some reason, most foreign tourists don’t make it part of their itinerary. My plan is to show you that if you do find yourself heading to Greece, then this place has to be not only part of your journey, but a highlight. From there I’m making a quick stop at the little-known Moni Island. It’s home to hundreds off peacocks and is one of the few places in Greece where you’ll find an animal that outnumbers the goats! Our final port of call for the episode is Spetses. It’s a place where life is lived in the outdoors, with the sun on your face and wind in your hair. As historic as it might be, it has a youthful energy about it that’s quite infectious, and every time I visit, I feel invigorated. Top General Experience – Snorkelling in old Epidaurus on a 2,000-year-old Roman villa only 100 meters from shore and in 2-meter-deep water. Most underwater historic sites are generally inaccessible, but this 2,000-year-old villa is accessible to any one that can tread water. You get to see the old foundations and the original floor paving in the rooms. Spetses is best known for its maritime history and is the perfect place to learn about the nautical past of the country and many of the most significant people and moments in Greece’s history. On this occasion, I’ve also timed my visit so I could see the spectacle that is the Spetses Classic Yacht Regatta. From Spetses I cruise across to Hydra. You really don’t have to travel far in Greece to find yourself in a place that’s completely different to your last port of call, and in the case of Hydra, it’s even more apparent. From the donkeys walking the streets to the amphitheatre like harbour with centuries old homes crowding the hillside, it’s a special place that seems trapped in time. Hydra is one of the busiest ports in Greece. Everyday thousands of visitors come by ferry to stroll around the harbour area, eat at the cafes, swim in the clear blue waters and take donkey rides to explore the town’s laneways. There’s no denying the beauty of the place, or its unique attributes. In this episode I’m continuing my exploration of the island and taking part in the island’s biggest celebration, The Miaoulia Festival. It’s a week-long event that commemorates Admiral Andreas Miaoulis, who was a leading figure in the war of independence. It includes boat races, concerts, cultural exhibitions and a finale like nothing you’ll have ever seen before. It’s an annual event that illustrates much of the proud heritage of the island and something I’ve always wanted to see. Top General Experience – Miaoulia Festival in Hydra. On Hydra, the Miaoulia Festival has developed from a single day celebration to over a week of activities and events culminating in a re-enactment of the sinking of the Ottoman Empire flag ship in the gulf just outside Hydra Harbour (including a massive firework display) on the Saturday. The whole harbour becomes an amphitheatre on the Saturday Evening with crowds lining the foreshore to watch a suite of entertainment that includes dancing culminating in an amazing Fireworks display. Loulas Tavern in Spetses on the beach. The Food has been a highlight generally, the isolation of most islands means that local produce is abundant in taverns with traditional cooking. Loulas tavern has been run by the same family for over 80 years; with the same three dishes on the Menu, Moussaka, Chicken and Soutsoukakia (long meatballs in red sauce). They can be accompanied with either, spaghetti, or potatoes. People take a 20-metre walk from the beach to the tavern for their afternoon lunch. I have been visiting Loulas for 37 years, it personifies the typical Greek island tavern, beach lifestyle. In this episode my journey through the Aegean continues, as I head deep into the Argolic Gulf to the port of Nafplio. It was the first capital of Greece after the War of Independence and is famed for its mix of architecture. Building styles that tell the story of different cultures having influenced the development of this unique port town throughout the centuries. It’s a beautiful part of the country with a rich and colourful history, and the landmarks to prove it. I’m also headed inland to visit one of the oldest settlements on earth, Argos, where I’ll be exploring the story of what was formerly one of the most powerful cities in Greece. From the ancient theatre and pyramid of Helinikon, to temple ruins and a hilltop castle, there are countless remnants from antiquity throughout this region whose stories continue to unfold today. As my journey continues, I explore more of Monemvasia and the inland area nearby. Here I’m going to learn about the past of the island and go from one of the oldest churches in Greece, to one of the most historic wine growing regions in the world. For many centuries a lot of wines from across the country would pass through the Port of Monemvasia, before reaching other parts of the Mediterranean and as far as Northern Europe. From there I make my way to another tiny island that punches well above its weight, Elafonisos. It might only be 16 square kilometres in size, but it’s a hidden paradise with a picturesque coast that rivals the prettiest places you’ll come across. Top Food Moment- Learning about the Malvasia wine produced in Monemvasia. It has been produced and shipped across Europe since the middle ages. I met with George, who has brought back to life one of the oldest wine varieties in the world. My journey has now brought me to the island my family came from. In this episode, I’m digging deeper into my family history, as I explore the island of Kythera. My parents moved from here to Australia, however I have a tangible connection to the pace that I can’t ignore. It now feels like a second home, but I’m still far from being considered a local. Every time I return, I discover new and fascinating things, and the places I’ve seen before have usually evolved a little. So, no matter how familiar I am with Kythera, there are always a few surprises! This is an intimate exploration of an island close to my heart and provides a rare insight to a place that’s both rugged and beautiful. Top Food Moment- Heading out with Kyriakos to the Potamos markets in Kythera to taste and buy local produce. Kyriakos then cooks up a favourite dish, called Bumies, that my mum use to make. These were markets I would visit as a child, so they hold a special place in my heart. In this episode I’ll be discovering more of the island paradise of my heritage, taking in places that I’ve never seen before, and revisiting old haunts to see how things have changed over the years. I’m then making my way to one of the most photographed places in Greece – Zakynthos. It’s the third largest island in the Ionian and a place where the beauty of the beaches rivals any you’ll come across in the Mediterranean, and possibly the world. I’ll also show you that there’s a lot more to it than just the sun and sand. There’s also a rich history and wild encounters to be had. Like most Greek islands, it never ceases to surprise. Top General Experience- Diving on the Mentor wreck on the island of Kythera. I was lucky enough to dive with the Archaeological team on this very famous wreck, a wreck that was carrying marbles from the Acropolis in Athens to the British Museum. I was also lucky enough to find artefacts while I was diving. Top Food Moment- Olive oil is one of the things Greece is famous for. In Zakinthos I met with Dionisis who took me through olive groves with trees that are 500 years old. I then learnt all about the process of making the oil. In episode nine of My Greek Odyssey, my exploration of Zakynthos continues. First stop though, is a quick side trip to Pilos for a very special dive. Then it’s back to Zakynthos to learn about the famed nougat of the island, before getting to know more about another thing it’s known for, the poet Dionysios Solomos. I also catch up with a good friend and visit a self-sustainable farm in the island’s fertile heart. Here we share some traditional food and plenty of laughs, while catching up and learning about life in a remote island. From there I head to the turtle sanctuary to meet a few of the locals, before making my way to a new port on the island of Kefalonia. I cover a lot of ground in not much time, so you won’t want to miss a single second of it! Top Food Moment- Learning about how nougat is made in Zakinthos. The island is famous for making it and every time I visit you leave with a few boxes to take home as gifts for family and friends. As my time on Kefalonia continues, I’m going to explore the stunning Melissani Lake, a place of both myth and beauty. There’re only a few such formations found on the planet, and it’s one of the more popular sites for tourists. I’m also going to meet a couple of the locals who spend their days at sea, forging a living as fishermen. It’s an occupation that has existed as long as humans have inhabited these islands. But as fish stocks decline, who knows how much longer this way of life will last. Plus, I’ll be catching up with a friend and trying my hand as a beekeeper, as well as visiting one of the famed wineries that produces the famous Robola, that Kefalonia is known for. Now that I’ve arrived in Ithaki, it’s time to explore what this ruggedly beautiful island has to offer. It might be small, but sure packs a punch. Because it is so tiny, it’s easy to see a whole lot in a little bit of time. From here, my journey will then take me to Lefkada. It’s a place full of myth and legend, dating back to antiquity. Being connected to the mainland via a causeway, it’s a busy tourist destination, but that hasn’t taken away from its authenticity. Dig a little deeper than the popular tourist haunts, and you’ll find a special place, with both natural, and manmade wonders. Top Food Moment- Learning from a farmer about how lentils are grown in Lefkada and then cooking them with Kyriako. Seeing firsthand how it’s been grown for centuries and then eating an amazing traditional dish eaten by your great grandparents was special and gave me a whole new appreciation of things. This episode sees me continuing where we left off, as I learn how the locals in Lefkada make their wine and check out a remnant of the Cold War. It’s one of those postcard locations that holidaying in the Greek islands provides around almost every corner. There are few parts of the world so beautiful and freely accessible, without hoardes of tourists. Yeah you might need to arrive early to lay claim to a daybed but stroll 50 meters up the beach and you’ll have a patch of pebbles to yourself. This week I also have a dream come true, when I visit Scorpios Island, once owned by Aristotle Onassis. Few have stepped foot on the island, let alone filmed it. From there we up anchor and head to Paxos, to show you a gem of the Ionian that most never visit. It also happens to be a favourite of my wife Helen. If this is the first episode you’ve seen of the show, then you’ve missed one hell of an adventure. Don’t stress though, because we’ve got some pretty special things in our series final. In the last episode of series one I’m headed to Antipaxos, just a stone’s throw from its bigger neighbour, Paxos. Then I’m upping anchor and making waves as I cruise across to Corfu, where I’ll be spending my final week in Greece, exploring the far north of the Ionian Sea. The last island I’ll step foot on for the series is Orthoni. It’s the northern-most island of the Ionian Sea and one of the Diapontia group of Islands, in the most western part of Greece. I’ve left a lot to do in a little time, so get comfortable, because you won’t want to miss a second of it! Top Food Moment – I’m a big fan of Greek cheeses (Fetta and Mizithra), so heading to a goat farm and getting hands on with the animals was not only fun, but enlightening. We then had Kyriakos make up a simple but absolutely beautiful dish using the freshest of Fetta and Mizithra cheese.